The Mallification of Manhattan continues with the recently opened Hudson Yards, an enormous project bringing a slew of luxury stores (supplemented with some classic fast fashion outposts) and big name chefs and restaurant groups to a massive, very shiny building. Like the Time Warner Center or the Oculus, Hudson Yards is a multi-level shopping center (or, as marketing materials spin it, a “vertical shopping experience”) similar to the suburban malls so many New York transplants are familiar with. Hudson Yards also refers to the larger neighborhood surrounding its raison d’être, accessible off the recently extended 7 Line. Luxury buildings with homes for rent and for sale, a Thomas Heatherwick design sculpture (The Vessel, likened to the Eiffel Tower by its billionaire developer) a new arts center called The Shed, and a smattering of rich people presently occupy the space that runs north from 30th to 34th Street between 10th and 12th Avenue. Unlike plenty of ostentatious new NYC developments, Hudson Yards didn’t quite gentrify a neighborhood, but rather create a facsimile of one. Built atop the train tracks on Manhattan’s far west side, north of the High Line, Hudson Yards, is replacing the grit of West Chelsea with dollar signs. 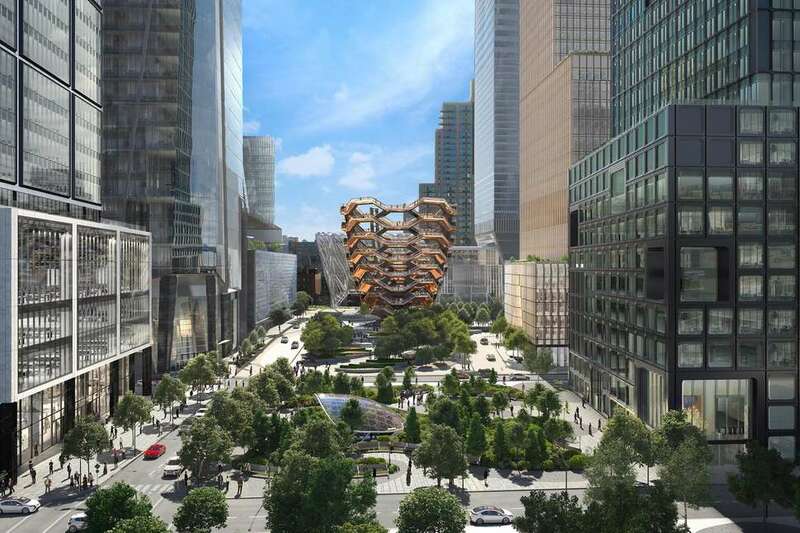 Sure, the glitzy new construction isn’t for everyone -- as an Upper East Sider friend recently said to me, “I’m so excited not to live in Hudson Yards.” -- but this thing isn’t going anywhere, and you’re probably at least a little curious about all the fanfare. So here’s your guide to navigating the glittering new district known as Hudson Yards. 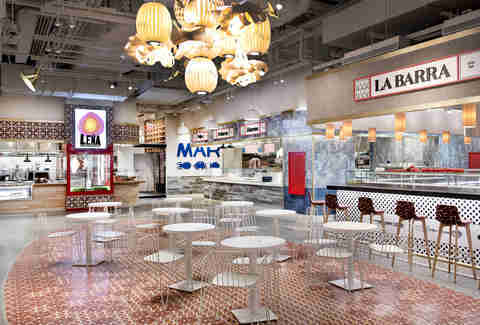 Superstar chef José Andrés’ first dip into the New York market is a multi-restaurant mega-food hall dedicated to all the culinary treasures of Spain. Grab some sliced jamon to go, sit and savor paella at the vermouth bar, or taste your way around the various kiosks dedicated to bites like patata bravas (fried potatoes with a variety of sauces), bocata and empanadas (small sandwiches and savory tarts), frituras and pulpos (fried seafood), and churros. Mall-phobic folks will be pleased to know you don’t even have to walk through Hudson Yards to enter this street-level Spanish mini-metropolis. This California-based sustainable meat company’s first foray into New York brings all that red meat you’re used to feeling guilty about eating, and flips it into an organic, more environmentally responsible lunch or dinner option. The menu includes exclusive-to-New-York bowls of cauliflower rice, greens or broth, fortified with meats like spiced lamb shawarma or grilled dry-aged beef. The duck confit poutine and 100 day dry-aged burger with raclette cheese are richer indulgences. As a colleague referred to it, “Chang World” is the Momofuku titan’s latest project, led by chef Eunjo Park. Park’s menu includes small raw dishes, stews, kawi set meals, and two excellent renditions of rice cakes: one with chili jam and country ham ($23) and another with a decadent Wagyu ragu. Yes, the menu is punny, but the interiors are stylish -- you’ll forget you’re in a mall, but may need that extra lap around to walk off all the food you stuff in your face. You could pop into Peach Mart next door, another Chang operation peddling a variety of packaged snacks and small hot bites, like corn dogs in spicy mustard. Britain-based restaurant group D&D London (you may know them from Bluebird in Columbus Circle) has extended its influence over Manhattan mall restaurants with a new chic English-inspired spot. Sure, the food is a little precious (think chicken foie gras parfait with stout jelly), but also satisfying (Burgundy truffle risotto! ), and if you want to debate Brexit over a shared rack of lamb chops ($48/person), this is your spot. Thomas Keller helped curate the entire food lineup at Hudson Yards, capping it off with an aspirational new restaurant of his own. Jewel tones, dark leather banquettes and an incredible skyline view define the luxe restaurant, which serves a “classic approach to Continental cuisine” alongside Champagne carts and live music. Reservations are already hard to come by for tastes of hand cut steak tartare, Maine lobster Thermidor, and prime beef short rib Wellington for two. What your dad probably referred to as “Needless Markup” is also this writer’s favorite store -- shoutout to the sale rack. Admire the mannequins, the shoes that cost more than your fantasy West Village studio’s rent, and see if you can’t scare up a deal. Sure, Kiehl’s is as ubiquitous in Manhattan as its Hudson Yards neighbors imported from abroad (like H&M and Zara), but it’s a New York-based (and founded!) brand. In addition to generous free skincare samples, the Kiehl’s Hudson Yards spot offers complimentary personalized skin care consultations, Apothecary Preparations custom skincare, and a “Recycle and Be Rewarded” program, which encourages customers to earn complimentary products by returning Kiehl’s empties to the store for recycling. Stressed from being inside a mall at the edge of Manhattan? This non-toxic, vegan and cruelty-free manicure company (with two other NYC locations) offers self-care focused manicures so you can zone out, stop swiping, and let a pro buff your fingers. Manicures start at $15, and the signature 40-minute guided meditation manicure is $30. If it does help you unwind, it’s much cheaper than therapy. 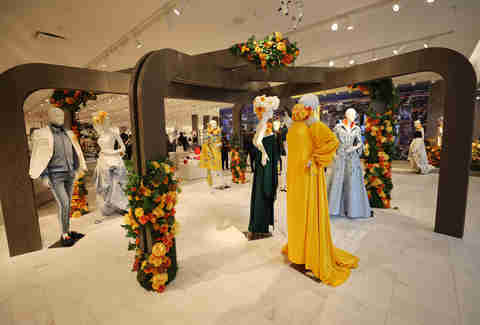 It’s own little mini world at the base of Hudson Yards, this department store curates women’s, men’s, and home sections, with plenty of Instagrammable displays that make it worth a walk through. A tea room also offers a semi-calm space to unwind and nibble on a scone. 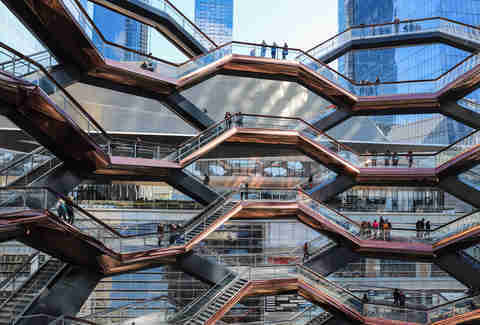 Referred to as the Hive by some, this honeycomb-shaped structure designed by Thomas Heatherwick lets you skip Barry’s Bootcamp and scale 154 intricately interconnecting flights of stairs -- that’s nearly 2,500 individual steps for an unparalleled view across the Hudson. If racing to peer at Hoboken doesn’t excite you, take advantage of 80 landings for selfies and viewpoints, though you’ll have to reserve a free ticket before entering the immersive sculpture. At the top of the High Line, The Shed merges Chelsea’s rich art and performance history with the glitzy new neighborhood. The shiny new building, which is very much not a shed, will host musical performances, visual arts, theatre, and dance beginning on April 5. This yet-to-open (predicted for 2020) 101st floor observation deck will be the highest in the Western Hemisphere, reaching 1,100 feet in the sky. Visitors can walk out 65 feet from the building and lean on a 9-foot wall of glass to live out Spiderman fantasies without actually scaling a single skyscraper. The deck is slated to open later this year, and already commands a waitlist. Thanks to its brand buzz, Amazon got all the hate when it appeared poised to move into Long Island City with hefty tax breaks, an issue many New Yorkers may not have connected to Hudson Yards’ financial incentives. 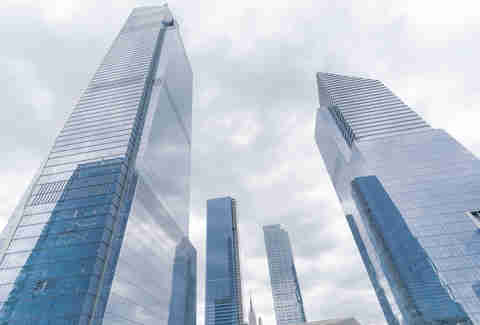 A March 2019 analysis by The New School found nearly $6 billion in tax breaks for the Hudson Yards development, which The New York Times estimates as a $25 billion neighborhood. Roughly $2.4 billion of taxpayer money was used to extend the 7 subway line to Hudson Yards, with about $1.2 billion used for four acres of public outdoor space. Related, the private development company responsible for the years-long project, has a real estate portfolio of over $60 billion, which fuels the debate of whether industry titans or citizens should pay for these shiny municipal projects. You probably won’t have to worry about this unless you’re very rich, in which case, congrats! 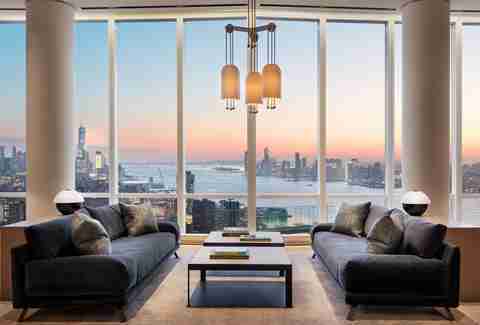 Hudson Yards and its luxury apartments are luring in well-to-do New Yorkers who can spend thousands of dollars a month for one-bedrooms in amenity buildings or perhaps drop a few million on a condo (plus the thousand dollar-plus HOA fees). NYC Housing Connect has also offered affordable units, starting at $858 for a studio, via lottery. Melissa Kravitz is a Thrillist contributor.